I am so looking forward to this weekend; we are meandering our way to the village of Hilton and will be attending not one, not two but three productions at the Hilton Arts Festival! Now in its 22nd year, the Festival, which takes place from September 18th to 21st at the very beautiful Hilton College, is the largest theatrical event of its kind in KwaZulu Natal. There are a large number of different events happening over the four days of the festival and they range in genre from drama, comedy, physical theatre, music, cabaret, mindscape, performing arts, children’s theatre, music revival, children’s workshops, adults workshops and supper theatre. Supper Theatre is the largest of the categories with a total of 25 performances taking place in the SPAR Drama Centre, the Memorial Hall, the Art Block, Chapel or Grindrod Bank Theatre. We have booked tickets for a production called ‘The Last Moustache’; a one man show starring Tim Plewman who, as his character Hiener Schmidt, has the unfortunate position of being the last remaining Hitler lookalike! The write up alone has me smiling! Theatre for the Young at Heart involves a selection of eight different productions which have been divided into three, age appropriate, categories. The Once Upon a Time series is for little people, Tales of Terror aims to entertain those between the ages of 11 and 15 while the Workshops are all age specific. Music is divided into both Music and Music Revival with the likes of Memphis 55 and Helena Hettema fitting into the Music section with their rock n roll and Piaf renditions respectively. David Salleras, Two Guitars and London based Irish violinist Darragh Morgan are just some of the acts who make up the Music Revival category. Mindscapes is a section that my husband has an interest in and as a result we have booked tickets for two of Rob Caskie’s hour long talks. The first of the talks is on Sunday at 10h00 and covers the topic of ‘The Anglo Zulu War’ while the second, at 13h30 gives an insight into the journey to the South Pole with Scott and Shackleton. Those with an interest in both fine art and fabric would probably enjoy browsing the hand painted fabrics from Caversham Textiles that will be on display in the Raymond Slater Library Reading Room. A wonderful section is the selection of workshops. There is a wide range of topics, from foam mask making to paper puppets, pottery workshops for adults, mosaics for all ages and camera workshops by the New York Film Academy. Craft workshops take place in the Art Block. There are also loads in the way of free music and events with both the DHS Band and Hilton College Jazz Band, among others performing for the crowds! 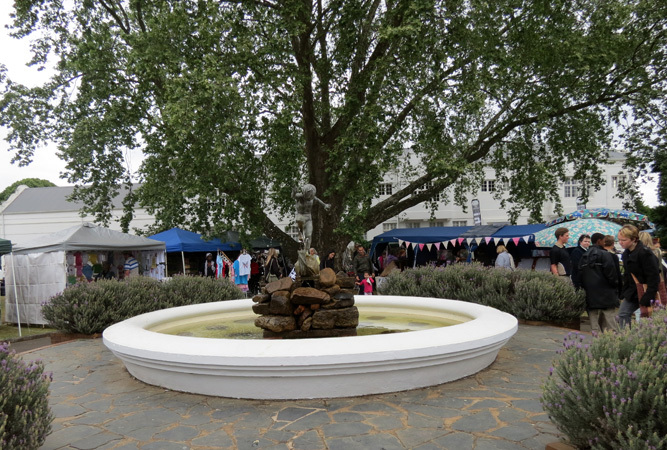 The Midlands Meander is well represented with a handful of their exhibitors present at the Festival. I am most excited to see the stunning work of well known artist Astrid Dahl. Dragonfire Beads and Groundcover Leather Company are two others I must make the time to see. In total there are over 150 craft stalls – so much to see and do! Tickets for shows are available via the online booking site and I would definitely book in advance to avoid disappointment. A number of food and drink vendors will be at Hilton College so make your way there and spend a day at least exploring the grounds of this magnificent school and supporting the fantastic lineup of shows and exhibitors on offer. Public parking is also available on the school grounds.